"Attractive chess game with good graphics in 3D, many boards and other features"
Intelligence, concentration and strategy are the keys to get to win a chess game. If you are a chess player, you know you'll stay very focused looking at the board while you're thinking on your next move. Now on that while, you will also be appreciating some nice graphics that this game brings to you. 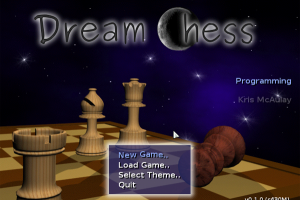 DreamChess is a chess game that features high-quality 3D graphics. Choose between different accurate boards and sets. Select classic wooden or the flat figurines for a new challenge. Play by yourself against the computer or face to face with another user. If you decide playing by your own, you will count with a pretty powerful engine included called Dreamer. But if you want a different one, you'll be able to add other engines compatible with XBoard like GNU Chess or Crafty. DreamChess also includes other features like sound effects, music, undo moves or saving games in the PGN format.